The Dual-Speed Compression adjuster allows you to fine tune your ride to a wider range of driving styles and riding conditions. You can now tune the shock's high- and low-speed compression damping independently by simply using the external adjusters, which allows you to maximize small bump compliance and traction while keeping the extra damping required for big hits. 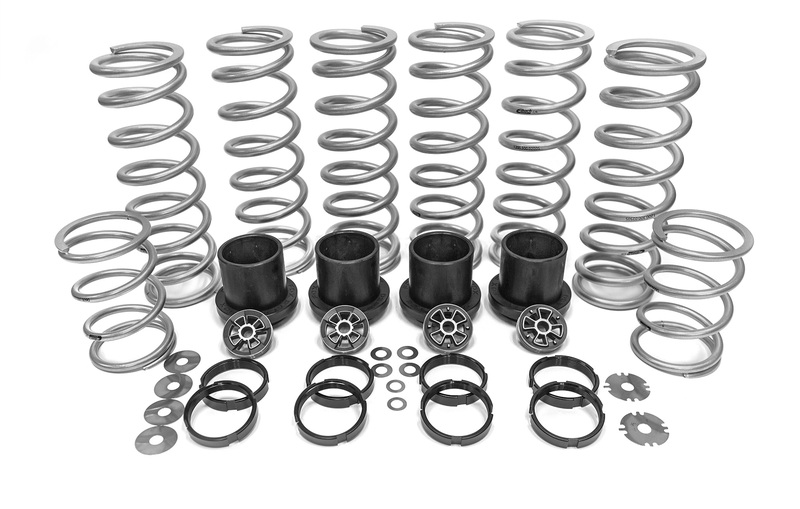 Our Dual Rate Spring upgrade kit comes complete with everything needed to upgrade your Polaris RZR Turbo to a true dual rate set-up complete with crossover adjustment. We use the highest grade quality springs available to ensure consistent performance and to avoid your from springs from sagging over time. Combine our Stage 1 and Stage 2 kits and you have now upgraded your Polaris RZR Turbo XP to our stage 3 package and you will experience the highest level of comfort , control and adjustment for any condition. 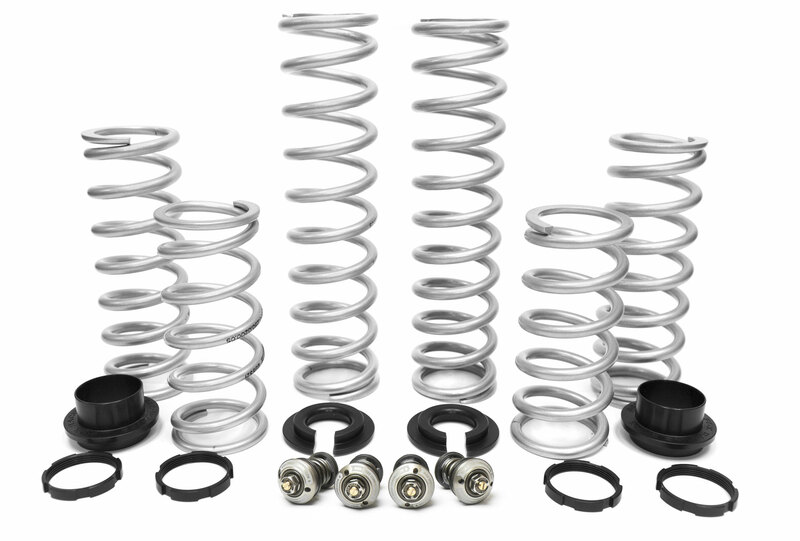 Take your riding to the next level with our Dual Rate Spring upgrade kit and race inspired valving update. Through extensive testing and development we have come up with a true Dual Rate spring package complete with crossover adjustment, coupled with our valve code and zone control upgrade you will notice what the best in control and comfort feel like. Combine our Stage 1 and Stage 2 kits and you have now upgraded your Polaris RZR XP 1000 FOX Edition to our stage 3 package and you will experience the highest level of comfort , control and adjustment for any condition. Take your riding to the next level with our Factory Race Series, Dual Rate Spring, Piston and Valving upgrade kit. 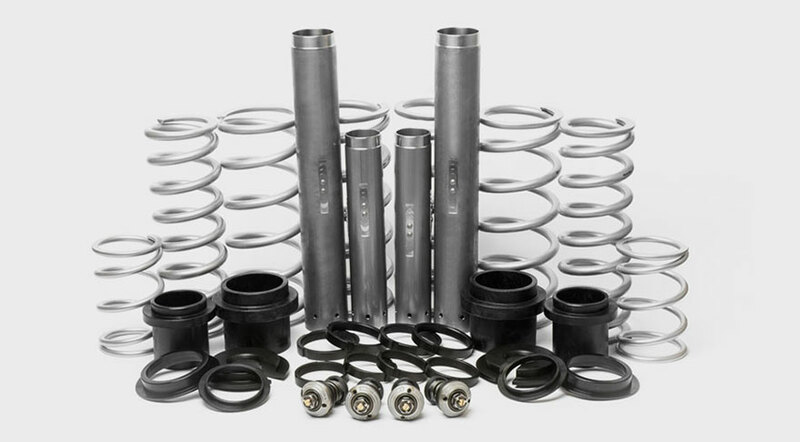 Upgrade includes new high-flow damping piston and valving, Dual rate springs with hardware provides adjustable preload, and crossover settings, resulting in a general, all-around improvement in ride, comfort and performance of your suspension. Upgrading your Internal Bypass shocks? For an additional $95 we will make the process easy. Our Box Program includes pre-paid shipping labels and a box that fits your shocks perfectly ensuring they will get to us and back to you safely! Upgrade your RZR-S*, RZR-XP, RZR-4, or Gator RSX 850i** without breaking the bank. Save thousands over replacing your stock FOX by upgrading with one of our 3 upgrade options. Choose from dual-speed compression, rebound adjustability, or the complete Stage 3 package, and get serviced by the same FOX technicians the pros depend on. *Stages 2 and 3 not available for RZR-S.
**Stage 1 not available for Gator RSX 850i. The Dual-Speed Compression adjuster allows you to fine tune your ride to a wider range of driving styles and riding conditions. You can now adjust the shock's high- and low-speed compression damping by simply turning the external adjusters, which allows you to maximize small bump compliance and traction while keeping the extra damping required for big hits. Available for Polaris RZR S, Polaris RZR 4, Polaris RZR XP. Price is for a pair of shocks, and does not include labor. Upgrade to the same performance and features as our 2.0 Piggyback RC2 coil-over shock. Includes DSC (see above), rebound adjustment, FOX high-flow racing piston, and valving set up. Targeting the aggressive dune and trail rider our FOX dual coil setup controls and reduces body roll and bottom out. Kit comes complete with all necessary springs and mounting hardware, including preload adjustment tool and racing aluminum retainers. Available for Polaris RZR-S. Price is for a pair of shocks, and does not include labor. This wide base spring retainer offers more support at high preload settings. Available for Polaris RZR-S. Price is for a single shock, and does not include labor.